Please note: This analyte is also sold as a U-PLEX assay. Click here to be directed to the U-PLEX assay page. MSD is continuing to sell this R-PLEX Antibody Set until inventory is depleted. If you want to order the R-PLEX Antibody Set, you can choose to purchase it from this page. The R-PLEX Human FGF-21 Antibody Set includes a matched capture and detection antibody pair and calibrator for the quick and easy measurement of FGF-21 in biological samples. R-PLEX products leverage MSD’s electrochemiluminescence technology for better sensitivity and a larger dynamic range than traditional ELISAs. R-PLEX matched antibody sets enable the development of singleplex and multiplex immunoassays. Individual assays may be developed using MSD avidin- or streptavidin-coated plates. Custom multiplex assays with any combination of R-PLEX analytes, as well as R-PLEX and U-PLEX analytes, can be developed on U-PLEX MULTI-SPOT plates. To learn more about the advantages of R-PLEX products click here. 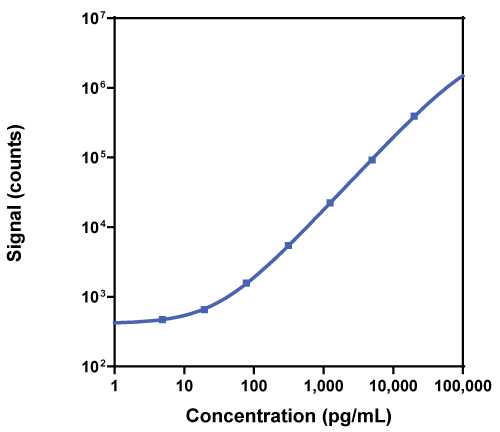 Calibration curve for the R-PLEX Human FGF-21 Antibody Set was assessed and representative data is presented below. Description - Fibroblast Growth Factor 21 (FGF-21) is expressed in the pancreas, thymus, liver, and adipose tissue. It has many mitogenic actions including cell growth, tissue repair, and tumor expansion. It regulates cellular metabolism including glucose uptake in adipocytes and sensitivity to insulin. FGF-21 acts as an endocrine regulator in lipid metabolism. It is involved in both gluconeogenesis and ketogenesis. Elevated levels are associated with type 2 diabetes and non-alcoholic fatty liver disease.